Lol by never I mean rarely but yeah I liked a few of your before. I am a Matt fan after all. @Joel might i suggest you lock the ability to craft runes right now? Would he negative feedback for sure but way less than the negative feedback from everyone losing runes. If the fix is a quick one hopefully it's unnecessary. Trying to communicate with everyone I can but not everyone uses Line or forums. Had the attack slot on my superior precision rune change to skill. Made me a sad panda. I had sort of the reverse situation occur. 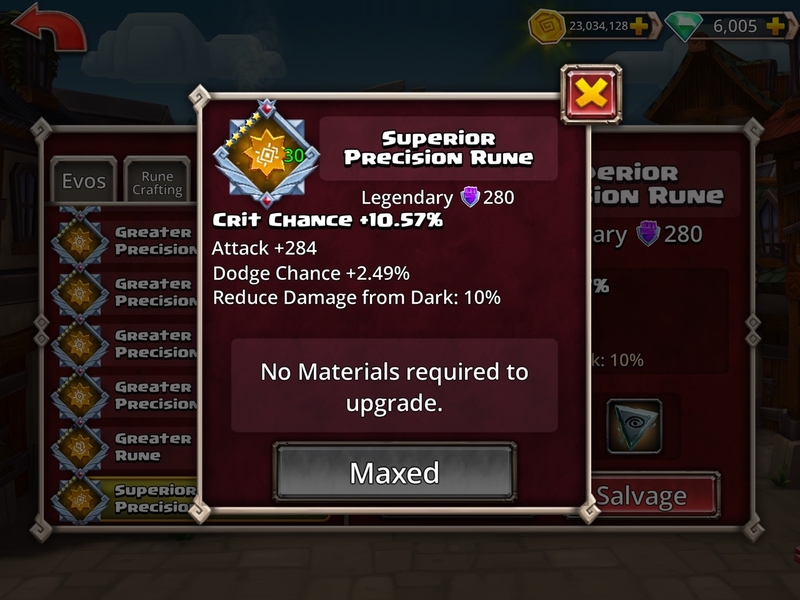 I crafted a superior dark power rune and was in the process of tuning it and was able to get it to a heroic 5* quality and I received an out of sync error. 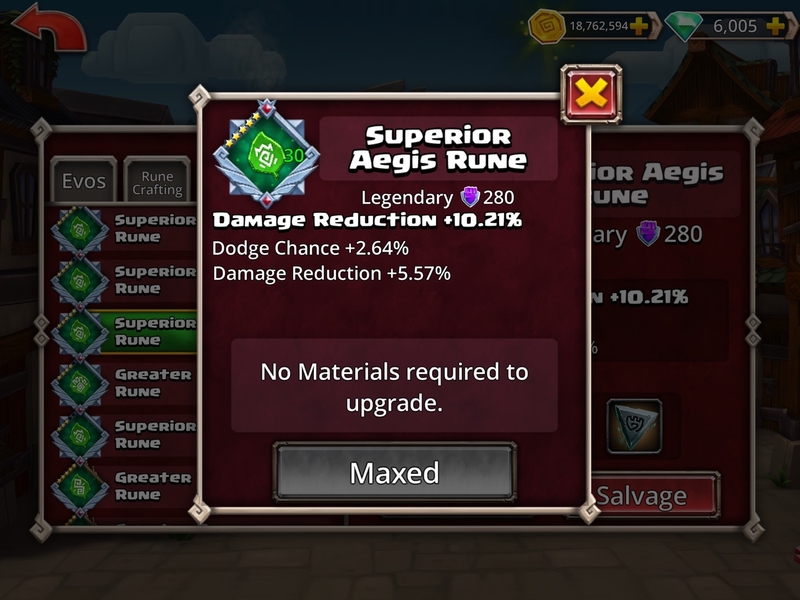 I reloaded the client and went back to crafting and the rune was sitting there fully upgraded to Legendary 5* .. weird. I've been working with customer support on this issue since yesterday at 4:45pm as well. Crafted a legendary 4 star champion rune, got an out of sync error and came back to a 5 star basic rune in its place. I'll pay you the gems back if you tell me how to craft Champion runes! We get how you feel. But can we have a thread without bringing the same tired stuff over and over? I actually had the exact same thought before he made the post. At least in regard to Aura's rune simply vanishing. It was very possible they implemented some sort of anti APM coding that kicks in when the app gets put in the background. Seeing all the evidence it seems far more likely this code leaked through from what I can only assume has to be related to the skill/resist rune changes. Or perhaps even updating the pvp rune rewards. The severity of this bug in terms of real value lost (gems/$) really really reinforces the idea that we need a Heroic Summon counter ASAP. I also had a 5* Legendary Superior planning rune that was downgraded to 4*. Not as bad as some of the others, but it's going to take a lot of gems to make up what I lost. I also spent about 7 or so tunes just to get from 4* to 5*. It hit Legendary 3* on my second tune. I submitted a ticket as well with screenshots. Hopefully they can do something about it, but I doubt they can get the actual runes back. My customer support ticket Including many shots I didn't post here. More examples of the issue. Whoops! Frustrated quick typing. 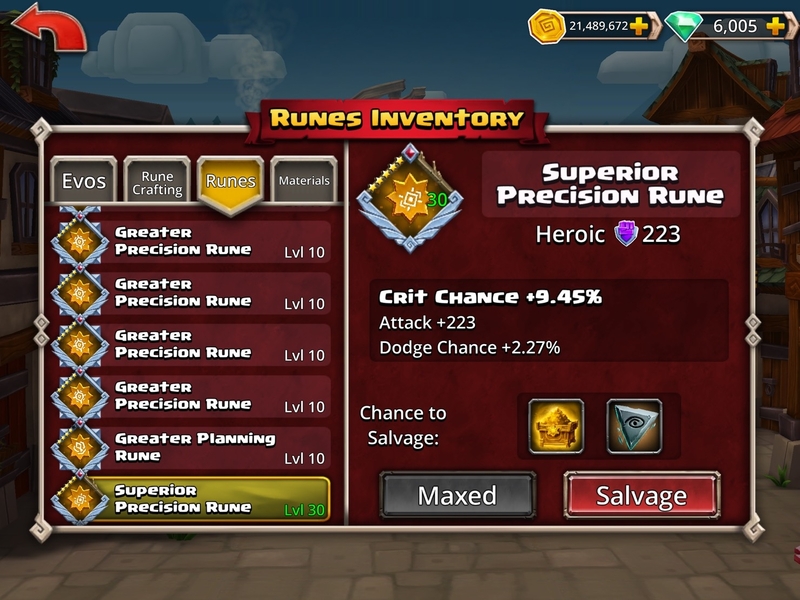 Crafted a legendary 4 star champion Tactics rune, got out of sync error, came back to 5 star basic rune in it's place. Had the same thing happen to me, out of sync and booting me. Went back in and couldn't find the rune. This issue should now be fixed! If you experienced this issue earlier, you can contact customer support about it, but don't need to report it here. If you are continuing to see this issue, please let us know. Is there some sort of miscommunication between you and customer support? Received a email saying this still haven't been fixed. Also will we get the previous higher rune quality back we made? I was going to help you out. but then I thought it might not be appreciated. We wanted to assure you that we are aware of the issue and are working with the developers to get this issue corrected as quickly as possible. While we don't yet know when this issue will be corrected, please keep an eye on the game's Forum and Facebook pages since new information will be posted there. Just a cut and paste reply from customer support. Appreciate them replying, but this feels like a move to clear some metric on their end. Just kinda checking a box that says replied to all messages within 24 hours. 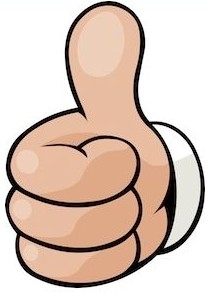 "Thank you for taking the time to write in to us. While we haven't had a chance to read through each and every email, we are reaching out to players that have written in to let us know that some of the runes they created were suddenly down graded. Big Fish Games Support Team"
I received the exact same customer support response. I am most unenthused. But it is what I have come to expect from them sadly. @Joel after this post it still happened to my friend, his greater legendary power rune downgraded to heroic. Maybe you will actually receive a personalized message. @Joel I really hope there will be an adequate way to resolve this issue. We honestly can't be expected to screen shot every single thing we do in the game just to double check and make sure a bug didn't climb all over everything. 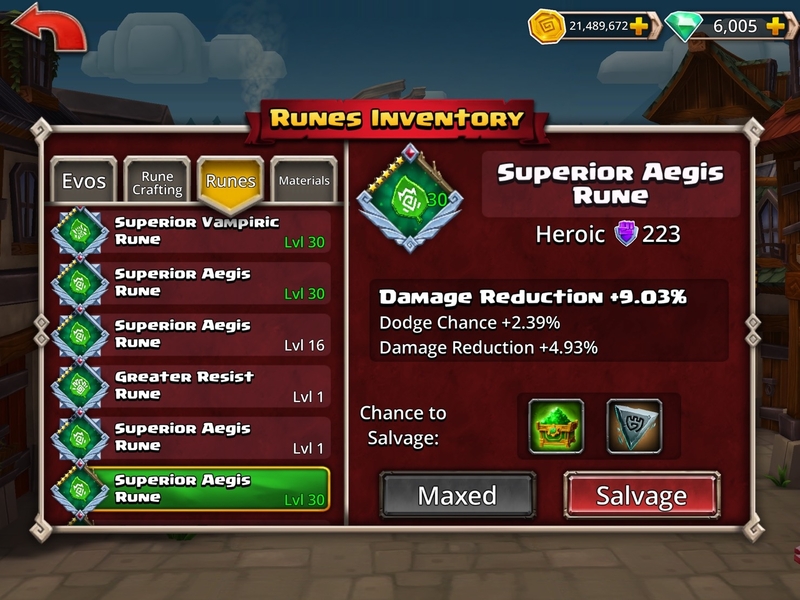 We are talking about materials and thousands of gems for superior and greater runes all being wasted. A few gems via the mail isn't going to be an acceptable resolution. Please let customer support know that. Sometimes I think they have a budget to purchase the compensation they send out. It's a digital good that costs zero to send out, yet compensation on these types of issues is never reasonable considering the resources lost. Even tho I have emails directly sent to my phone I've been checking every 30 mins for it lol. I received the same canned email response yesterday. I too am curious as to what they can give in compensation other than somehow give us the runes that we originally crafted.